The Magner Career Center collaborates with all departments and offices on great career programs, cosponsoring events, and more. Over the past several years, the Magner Career Center has worked closely with faculty and staff to support their department or office's goals. The center is a resource for students, but we can always use the faculty's help in encouraging students to start working toward their careers. What are the best ways to help your students launch their career? Encourage your students to use our services as soon as possible. The earlier they prepare, the more competitive they will be after graduation. 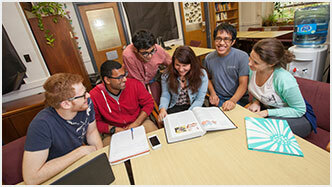 Add a small blurb about the Magner Career Center in your syllabus. For example: "What will you do after you graduate? The center, located in 1303 James Hall, has valuable resources including résumé and interview preparation, finding an internship, choosing a career, and more. Please review the 10 Tips to Plan Your Dream Career guide to take charge of your career success." Connect us with alumni and employers who are willing to share their career experiences with students. They can serve as mentors, offer internships/job opportunities, or serve as speakers at our events. See how the Magner Career Center has worked closely with the Koppelman School of Business to provide the school's students with the best opportunities. If you are interested in building a similar relationship, e-mail us or call us at 718.951.5696. Let us help fulfill the career needs of your students by providing job/internship opportunities, alumni mentors, having alumni speak to students, arranging company visits, and more. Read about what faculty and staff have to say about how the Magner Center has helped them and their students achieve their career goals on our testimonials page.